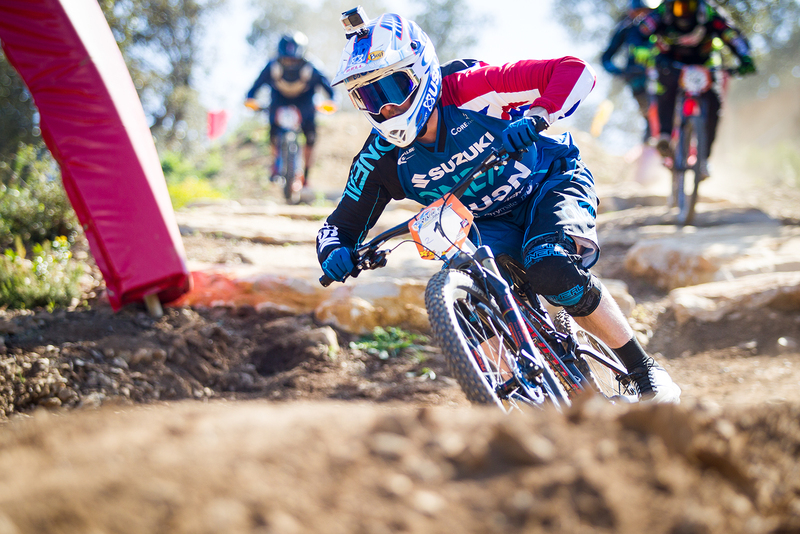 4X ProTour begins this weekend with round one being held at Winterberg Bikepark in Germany. Here is Scott taking a run down the course giving you a track preview for the racing this weekend. 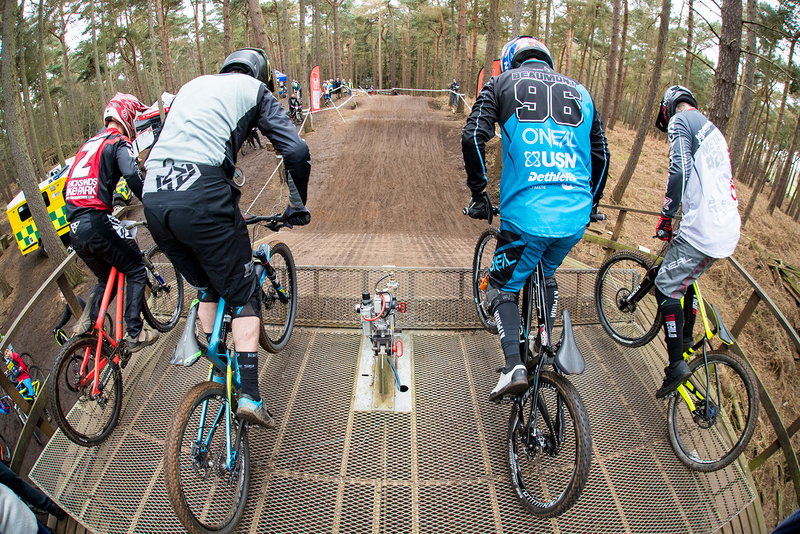 Schwalbe British 4X Series Round 1 – Chicksands. 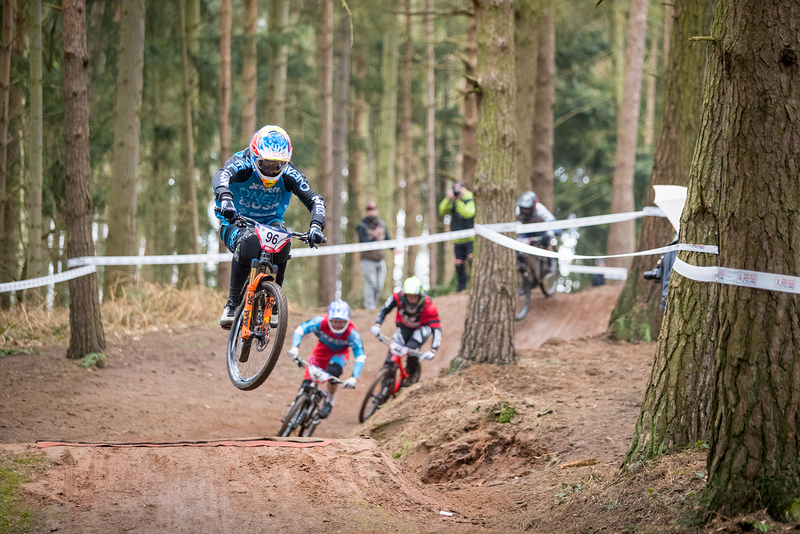 After the long winter break, USN Racing fired back into action with round 1 of the 2018 Schwalbe British 4X Series which was held at Chicksands in Bedfordshire. 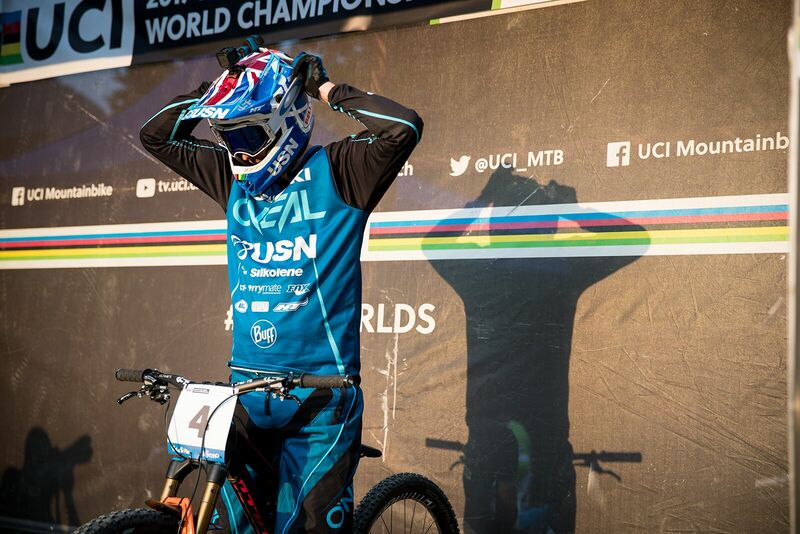 After a film shoot with title sponsors USN on Tuesday at the track, team rider Scott Beaumont decided to miss Saturday afternoon’s practice and arrive on Sunday for practice and the race. 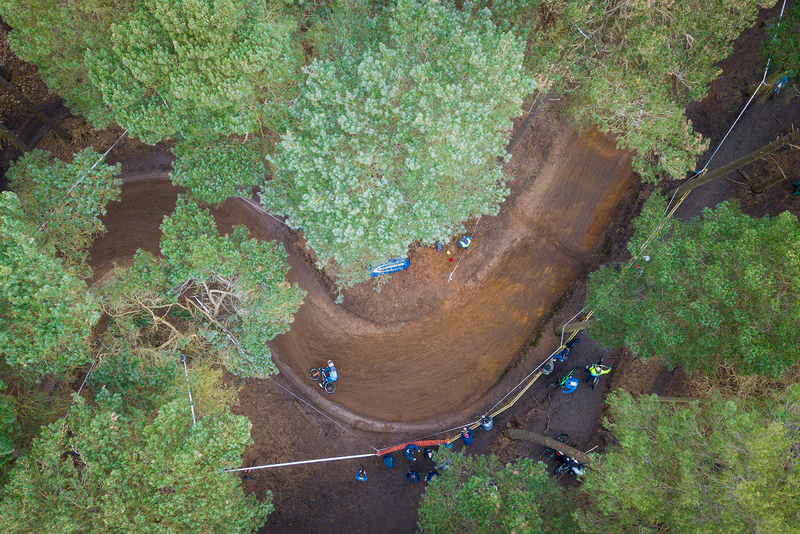 The relatively smooth and flowing track is fairly simple so after a couple of practice runs on Sunday, Scott was immediately up to speed and looking good. For the elites, the ‘S’ bend at the top of the track is where all the action takes place. Britain’s fastest riders, all still bunched together head into these turns trying to out brake each other. Sometimes it works and sometimes it all unleashes! In the motos Scott took a win and two second places which he was fairly happy about. He led races, was passed and crucially made some great passes himself on this tight and technical track. Into the semi final as the top seed in his race, Scott took gate one on the inside. Making a perfect gate, Scott led the race from start to finish which would in turn seed him through to the final as the top seed giving him the all important first gate pick. 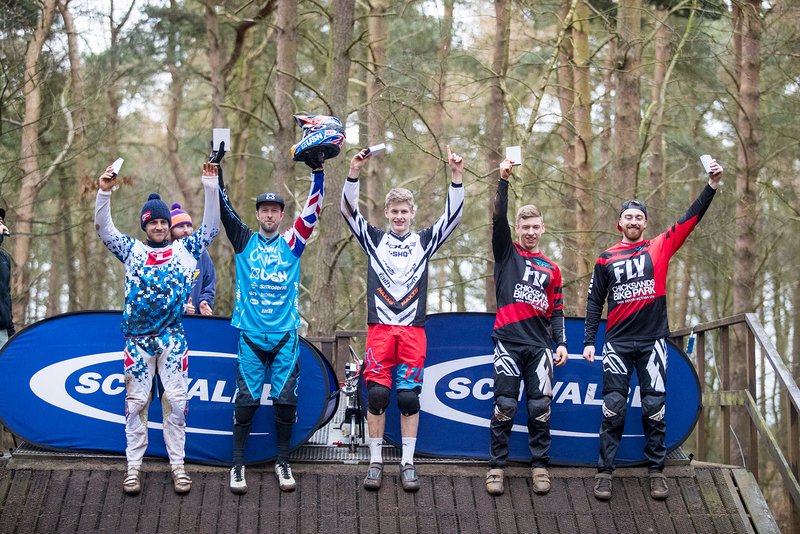 Scott took gate one with former GB Elite BMX rider Grant Hill in two, local hero Connor Hudson in three and Junior National Champion Aaron Dalleywater in four. The gate dropped and Scott was level with Grant down the first and second straight. Into the ‘S’ bend Scott was on the outside and in position for a big move around the outside. Then Connor dived inside of both Grant and Scott. 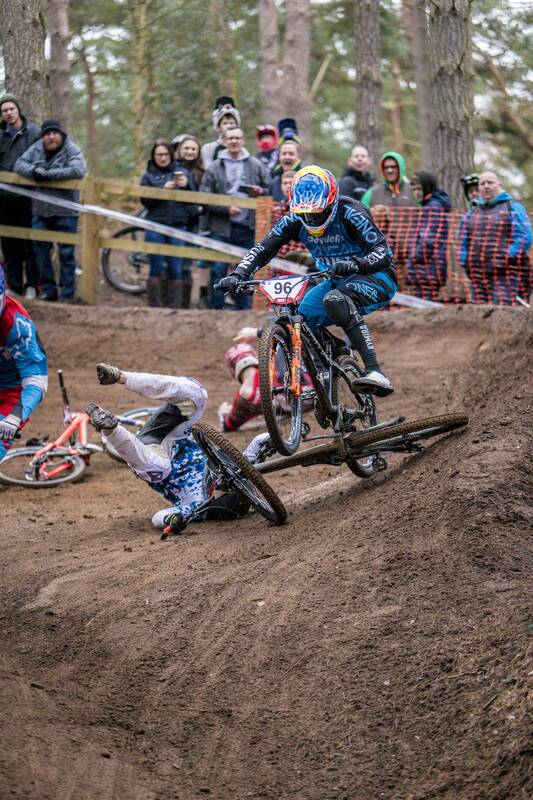 He lost the front wheel and crashed. Grant then went down in the domino effect and Scott with a quick decision jumped over Grant’s bike! Arron in the meantime picked a nice line around the inside of the carnage and went into the lead. About 10 bike lengths behind, Scott got going again. Riding the bottom part of the track like a freight train, Scott was impressive in closing the gap to just a bike length across the finish. He ran out of track to take the win, but Scott was happy with the day. ‘Today has been great. It’s been a long winter and now with just 8 weeks to go until the first 4X ProTour it is good to get racing again. Although I didn’t take the win today, there are a lot of positives to take away. My track speed was really good, and it has been a good start to the year. Congratulations to Aaron for taking his first win. It was awesome to see so many riders racing 4X in the UK.’ Said Scott at the finish line. It is now back to training for an intense block of work ahead of the ProTour starting. Thank you to all our partners for the 2018 season. It’s going to be a great year. This Sunday, 11th March, the 2018 Schwalbe British 4X Season fires back into life with round 1 of the year at Chicksands in Bedfordshire. 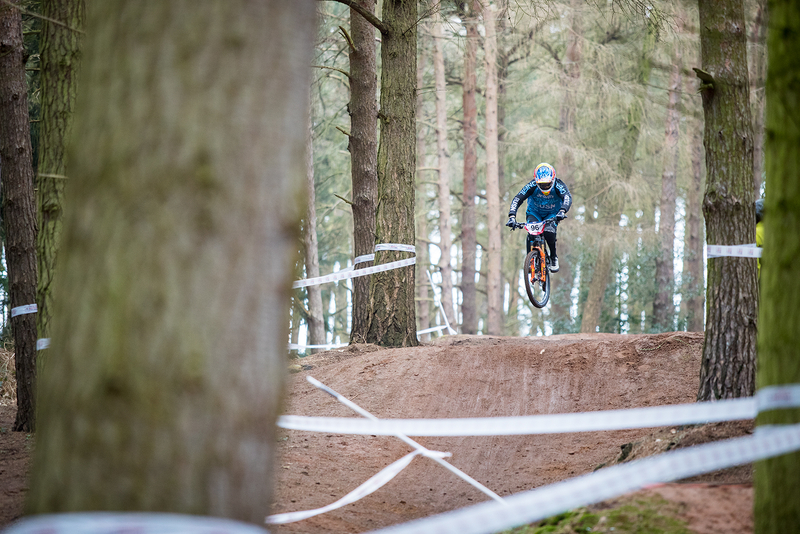 Here is the track preview from USN Racing’s Scott Beaumont. See you all trackside on Sunday. 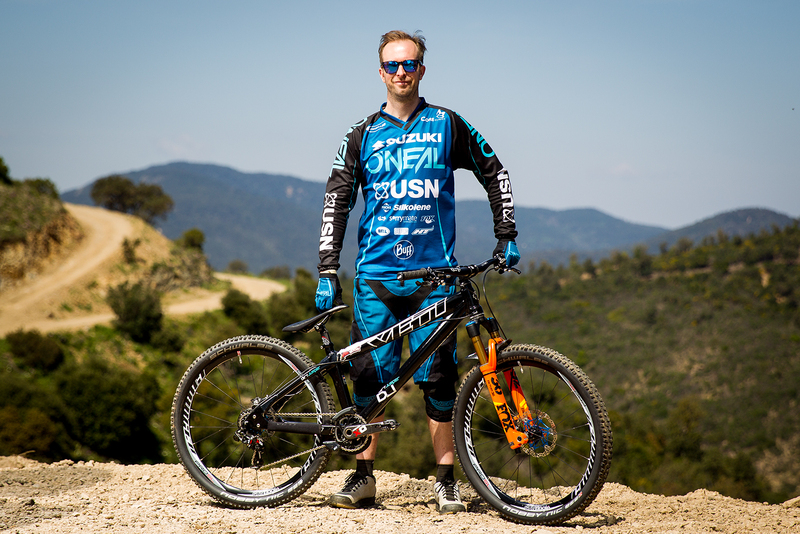 Datatag ID, arguably Britain’s most trusted security marking company, has signed up to support National MTB legend and current World ranked No.4 Scott ‘BOOMBOOM’ Beaumont in his bid to win his 9th National 4x title this year. Scott, who has been competing and winning since the age of 4, who went on to win his first BMX World Championship title in 1995, will be aiming to cement his place in the MTB Hall of Fame he was awarded in 2014 with yet another British title win in 2018. Datatag’s Cycle PRO system fitted to all of Scots bikes incorporates an array of security marking features including invisible UV etching to protect frame and forks, hundreds of microscopic Datadots to protect valuable components and a visible tamper evident warning label with QR code linked back to Datatag’s secure database and 24/7 international contact centre. The combination of this layered approach and the fact that the system requires no specialist tools to identify a bike at the roadside means it’s a real headache for thieves and a godsend to the Police. Datatag Cycle PRO system is a low cost one off payment which provides a lifetime’s protection for your bike and can be easily transferred into a new owners name should you sell your machine. Available through many independent bike shops and on line. Happy New Year! I hope you have had a great winter so far. 2018 is here and we are preparing for a great season ahead. With new partners, new races and some great media plans in place, we can’t wait to get started. Full press release on our plans is coming very soon.